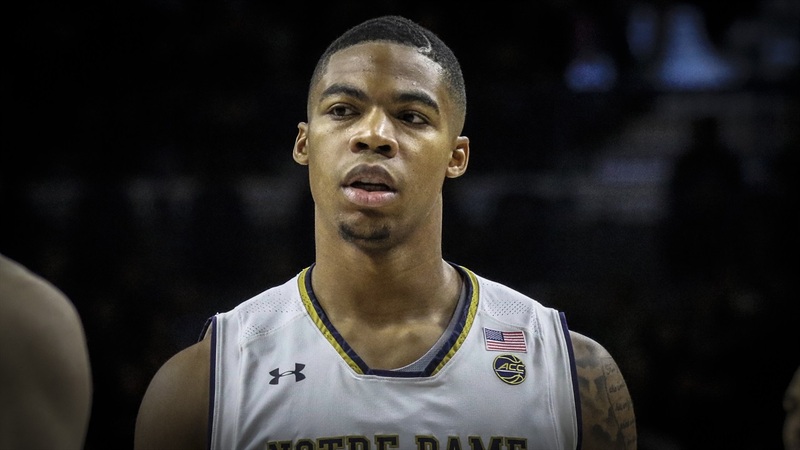 It was a night of ups and downs for Notre Dame as the Irish beat Chicago State 89-62. Senior Elijah Burns had a career night with 15 points on 5-of-6 from the floor with five rebounds, but it was timely baskets from freshman forward Nate Laszewski that got the Irish out of a hole. Burns brought much-needed energy throughout the game and that's exactly what he wants to do. “I’m going to do what my team needs me to do," stated Burns. "Rebound, talk, defend or whatever they need me to do. I just want to win games. The game started with the Irish jumping out to a 28-10 lead with just over 11 minutes to play in the first half, but Chicago State answered with a 12-0 run with cut the lead to 28-22. Laszewski knocked in a three-pointer with five seconds left to go in the first half to give Notre Dame a 40-35 lead at the break. Through two games, Laszewski is averaging 12.0 points a game to lead the Irish. Brey prepared his team for growing pains and the first half was ust that. “The group that ended the first half and started the second half defended,” explained Brey. “It was one of those games where you get off to a good start on offense and think it might be real easy. You don’t do much defensively, and they get a little confident. 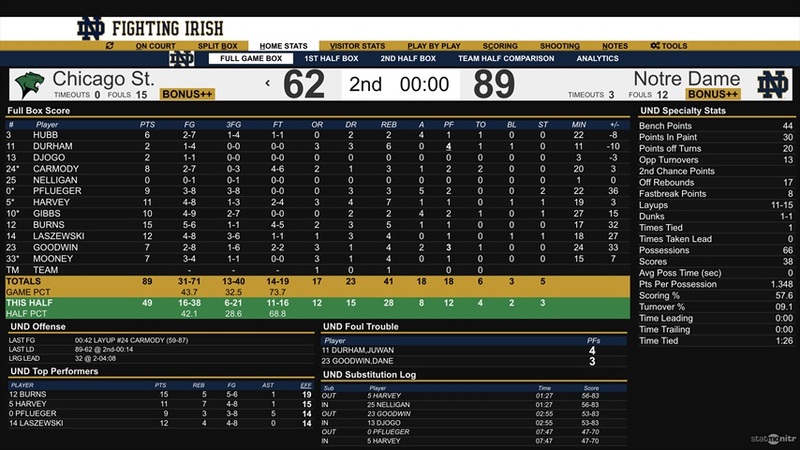 Notre Dame listened to Brey’s message and came out with a 12-0 run to open the second half behind six points from Burns and three-pointers from TJ Gibbs and Rex Pflueger. One of the buckets by Burns was a posterizing dunk on Cougars guard Anthony Harris. Gibbs finished with 10 points, two rebounds and four assists, while Pflueger added nine points, three boards and a team-high five assists. While the Irish offense started strong, it was the defense that Brey was looking for and they delivered as Notre Dame held the Cougars to just 27 points in the second half. However, Brey knows his rotation needs to get ironed out sooner than later and it can’t just be based on one side of the court. “There are a lot of even guys. I can’t answer it right now,” explained Brey. “We don’t play until next Wednesday, so we have to think about it a little bit. We kind of did it at halftime. Notre Dame shot 44% from the field, despite going 13-for-40 from three-point range. 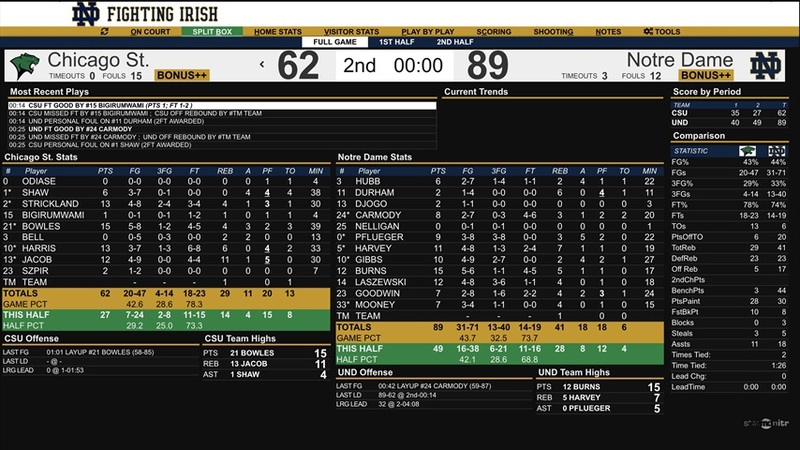 Brey wanted his guys to drive the ball in the second half, and they did just that even though the Irish took 21 threes in the final 20 minutes. Notre Dame’s bench outscored Chicago State 44-3 in the game.